Ann Loseva, one of the BritishCouncil's new TeachingEnglish associates, has written a very touching post called I HATED THAT FELLOW (C) C.G. JUNG on her personal blog that is a reflection on cheating/plagiarism undertaken by students and the reaction of teachers have to this. It made me think of the times that I called out students for cheating or plagiarism and I thought I'd share something related here on my blog. 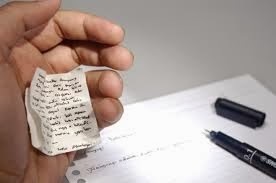 When I worked for a private university in Barcelona, I used to have zero tolerance for plagiarism and cheating. There was one short specialised course in particular that I taught for which I required a specific piece of writing that some students found difficult to do and which prompted some to copy and paste from articles they found on the Internet. I warned the students at the beginning of the course that if I considered plagiarism to be the ultimate sin on this course, and would give them '0' not only for the work submitted, but for all of the course if I caught them doing it. I told them that if it were up to me, they'd be thrown out of the university. It's a particular bugbear of mine because I hate laziness, especially when people try to skive hard work and get something for nothing. Despite the warning, there were those who submitted obviously copied texts. They are usually easy to spot as it's highly improbable (impossible, in fact) for upper-intermediate students to submit writing in the style and manner of a professional journalist. I don't even remember any of them trying to be clever about it and changing some of the text to include mistakes, although there might have been some who did this and who got away with it. The worst cases were those who had copied and pasted badly, including parts of the original web-page (buttons, other odd formatting) in their printed texts. I'd usually confront them at the end of the course, when they'd meet with us to discuss their marks and they would have the chance to argue their case if they thought they'd been treated unjustly. Most of the guilty wouldn't turn up to contest my decision, preferring to shirk away from confronting me. Some did and then stared down at the ground and mumbled apologies when I presented the evidence of their misdeeds. I remember one, though, who confronted me and despite acknowledging he had blatantly copied and pasted his work, tried to persuade me to change his mark because otherwise he would fail English. I refused and he became quite aggressive in his stance, even trying to tell me that his father was very well-connected with the university and that he would speak to the director and make things difficult for me. I called his bluff and told him that my decision had been made and that he should go ahead and do what he thought was the right thing. He stormed out of the school. I don't know whether he tried to get his father involved or not, but fortunately I never heard from him again. Students photocopying books. Despite most of the students being very well-off, in many subjects, one student would buy a book and lend it to others who would photocopy it. They would often do this using the photocopying facilities in the school, and for some courses, a photocopied book would be available to buy there. Academic dishonesty. Some of the tutors on the university courses were not properly qualified. Two of them I know were put on official student lists during the time I was there so they could be granted degrees from the university, despite not ever going to class or studying any of the subjects. These tutors were experienced, but did not have sufficient qualifications. Despite this, they were teaching on undergraduate degree courses, and one of them was even tutor of the university's Master's programme. Hardly surprising I suppose that there was a cheating/plagiarism culture amongst the students. From time to time, I read posts on Facebook from people who wish it were easier to keep track of the many ELT conferences that take place annually, and it's true - I expect it's on the wishlist of every ELT conference speaker and those who attend conferences, but rather than it stay simply a wish, what would be the best way to make it happen? 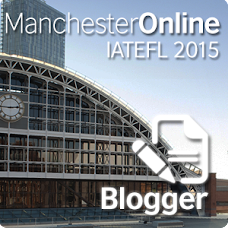 The major teacher organisations are probably in a good place to make it work, and it is true that IATEFL publish a listing of conferences in their Voices newsletter, but this is only available to members and so not accessible publicly online. TESOL publish a calendar of events, but this only seems to include those events related to the organisation or affiliates (the annual IATEFL conference is not included on the list, for example), so unless someone well-placed in either of these organisations takes it on, we'll have to look elsewhere. The British Council is another organisation very well placed to manage such a list, especially given the support the organisation gives to ELT conferences around the world, on a local, national and international level. Perhaps the best place to host this list of conferences would be the excellent Teaching English website, and indeed there is a home for this list there, but "the directory of upcoming educational events and conferences around the world" currently only lists past conferences and so is hopelessly out-of-date. A quick search on the Web leads to other listings, such as the Conference Alerts website, with a listing of language conferences worldwide and the ELT Calendar, which lists only events in Japan. Individuals have also tried to compile lists, such as the 2013/14 conference calendar for Turkey published by Tony Gurr. Perhaps the best way of promoting such a directory though, would be to adopt what other professionals in other sectors are doing, which is using the website Eventbrite to publish details of an event and to use the associated website Lanyrd to give details of speakers/attendees and help them connect to each other. Eventbrite is now being used a lot by some ELT associations to publicise events - I first realised its effectiveness for this during this TESOL Spain event in Barcelona - it seemed to make it easier for the organisation to manage the event and easier for the participants too. As for Lanyrd, I came across it again last Sunday (although I'd actually signed up for an account in 2012) and discovered that BRAZ-TESOL have been flirting with it for a while now, although it doesn't seem they are using it for all their events and haven't used it recently. 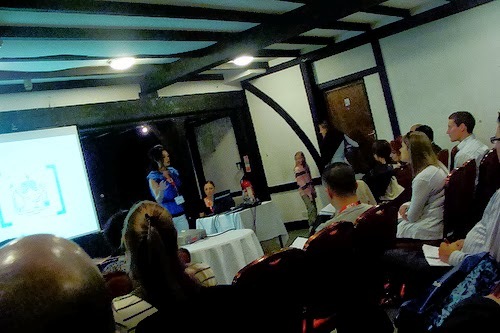 As a conference speaker it looks like a very interesting way of advertising what you have to offer and a great way of connecting with people at events, but this would only work if other people actually use the site (as is the case with all communities and social networks). What do you say, shall we give it a go, or do you know of a better way to keep track of ELT events and the people who attend them? 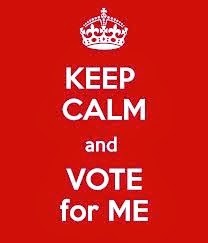 I should have remembered this (Thanks to Julie Raikou! ), but Tyson Seburn has been keeping a crowd-sourced ELT events calendar which is probably the best source that is available at the moment. There's a form where people can submit an event at the bottom of the page, so I encourage you to do so whenever you know of one that is happening. Looking forward to TESOL's annual Electronic Village Online this year, which has just opened its call for participation. I am giving a session and helping out with the moderating of Teaching English to Young Learners and Teenagers. Their blog is here and communication between members is taking place on the TEYLT2014 Yahoo Group. Crafting the ePerfect eTextbook promises to be a very interesting session, so I've signed up for that too. This group is connecting through a Google+ community and is using Listly to share resources and using the Twitter hashtag #EbookEVO. The session syllabus is here and the The list of moderators is extensive and includes many well-known teachers, teacher trainers and material writers. It's being sponsored by the IATEFL TD SIG and IATEFL MaW SIG and aims to help participants "outline, design and complete 1 chapter of an e-textbook that meets their learners' needs ". The moderators and other participants on the session will provide feedback during the five weeks. 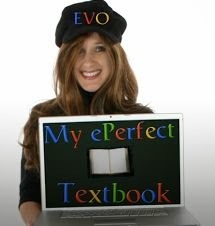 The final EVO session I've signed up for is ELT podcasting. I used to do a lot of podcasting, but haven't done so much in recent years. I've decided I'd like to start a new podcast this year, and so through this group, I'm interested in connecting with other podcasters and seeing what's changed and what people are doing. This group has three blogs: a session blog, an activity blog and a readings blog. They are communicating through a Yahoo group and through Twitter (#podcasting2014 is the hashtag). Are you participating in EVO2014? If so, what sessions have you signed up for? 2013 was the tenth year of the annual Edublog awards and when I began this post (in December) voting had just opened for nominees. I remember when the awards started, back in the day when it was just about conceivable to regularly read all of the major edublogs, and I also remember being thrilled when my podcasting blog (now defunct) was short-listed for an Edublog award in 2005. Then, the awards were generally embraced by the educational blogging community as a way of recognising and highlighting the ground-breaking work that educational bloggers were doing. Blogging wasn't the mature form it seems to be now, and it was both exciting and necessary for the edublogging community to have something that brought us together and which drew attention to what individual edubloggers were doing. The main criticism of this type of award is that it is little more than a popularity contest, but I suppose this is true of many awards. It is probably true to say that there is no awards system which is not flawed. It would be fairer to judge it another way, maybe. A group of experts selected by the awards, perhaps using the Delphi Method? This is the way the winners of the British Council ELTon awards are decided and the identities of the judges are kept secret. But, then who selects the judges? Generally, past winners of the awards, along with ELT luminaries and British Council staff are are invited to be the judges (as far as I can tell). However winners are decided, it is certainly a thrill to be nominated, and even more so to win an award. I remember being very excited when Digital Play was nominated for an ELTon in 2011, and it was totally unexpected honour when the book won - I really did not expect it (which was why I was in the Gent's loo when we were called up to accept the award and to make a speech). My second book, Language Learning with Technology (CUP, 2013) has just been awarded the English Speaking Union's HRH Duke of Edinburgh Award, and I have rearranged my travel plans to make sure I can attend the ceremony on 25th February. One of the reasons it is important is it makes you feel it all worth the effort. Methodology books never sell enough copies to make you feel the enormous amount of time and effort that you have invested in the writing and editing was worthwhile, so you have to find other reasons to justify the time you spent on them. Winning an award is recognition that you spent your time well, as is reading a review of the book and hearing from colleagues and friends that they are using the ideas in the book. Writing a blog and sharing your thoughts, ideas and reflective practice can also be hard if nobody drops by to comment - if you feel there's an audience out there reading and appreciating what you write, however, then it feels that all is worthwhile. If nothing else, initiatives such as the Edublog awards encourage readers to blogs and draw people's attention to blogs they may not have otherwise come across - I always make sure I check out the winning and short-listed blogs and so I'm firmly on the side of these virtual pats on the back.